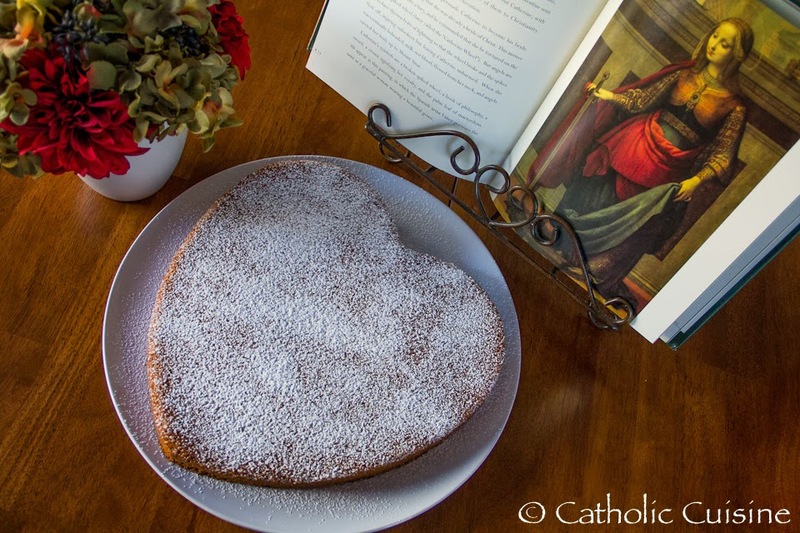 You can read more about the tradition of "Heart Cakes" on the feast of St. Catherine in the archives. 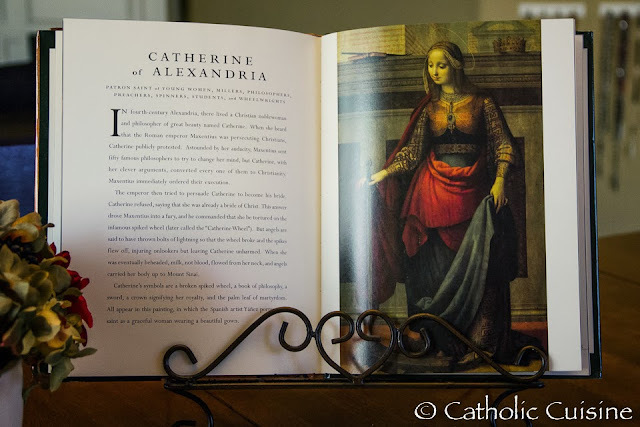 St. Cecilia, whose feast is celebrated on November 22, was named the patroness of music because “While the profane music of her wedding was heard, Cecilia was singing in her heart a hymn of love for Jesus, her true spouse.” She is often represented in art with an organ or organ pipes in her hands. 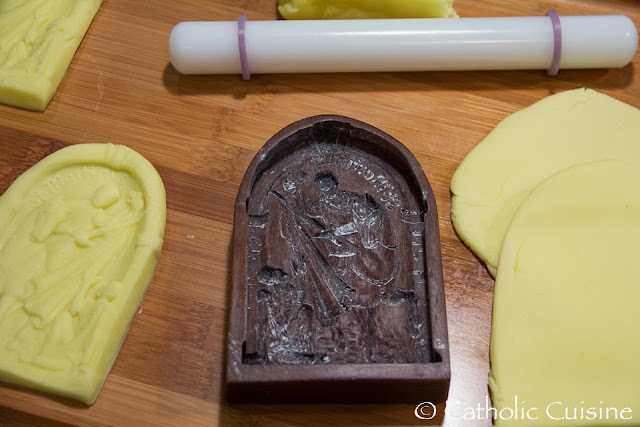 In honor of her feast you can easily create “St. 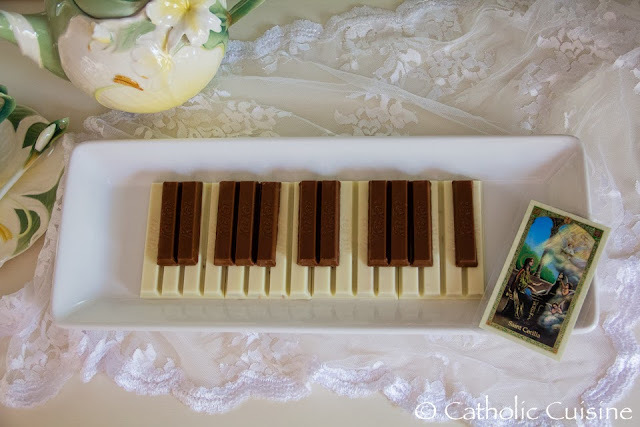 Cecilia’s Heavenly Music Candy Bar” using Kit Kats! 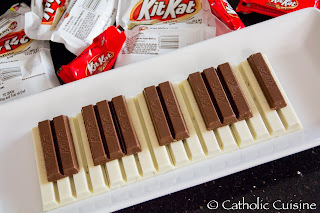 Unwrap the KitKats and aassemble the candy on a serving dish to resemble an organ keyboard. Enjoy! St. Cecilia, special patroness and advocate of all singers, musicians, authors, and students, pray for us! 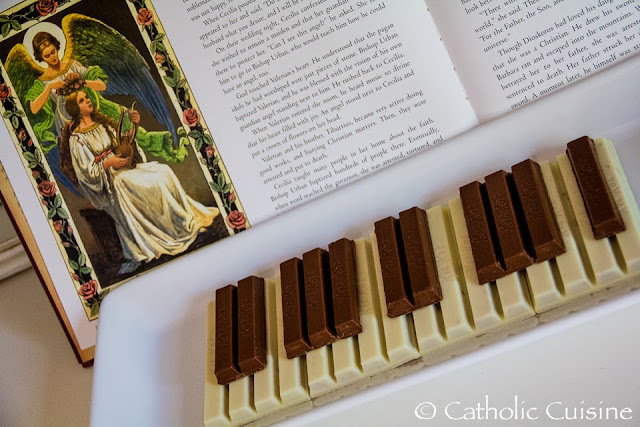 I came up with this idea this morning not intending to blog it but my kids really liked it, so I'm sharing it with you. 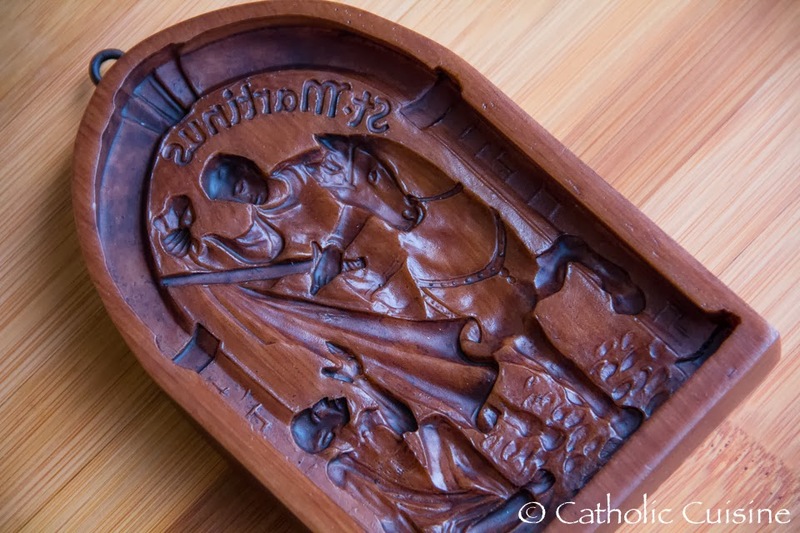 The story of St. Martin of Tours is that when he was a soldier, he came upon a beggar outside of the city gates who was in need of clothing and warmth. St. Martin, having nothing else to offer, took off his beautiful cloak and cut it in two giving half to the beggar to keep him warm. Later that night, St. Martin had a dream that the beggar man was really Jesus and he was commending St. Martin for his generosity to the angels in Heaven. 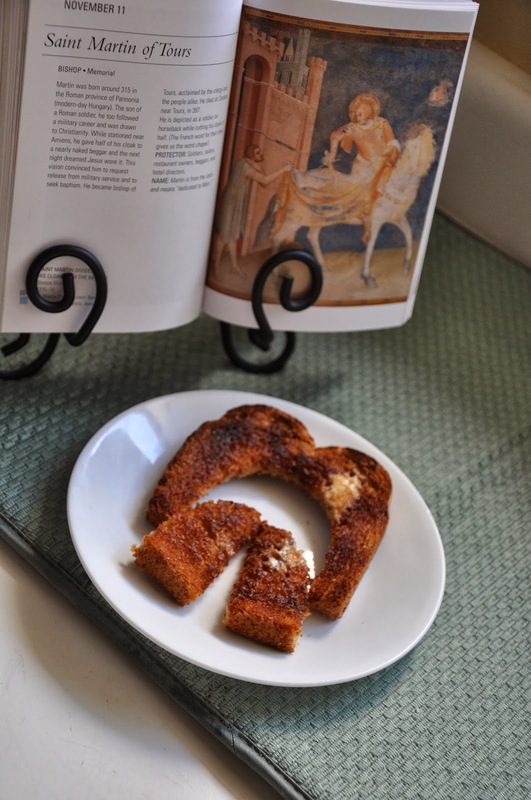 In honor of that story, I made these cinnamon toast treats to look like gates and cloaks. My oldest daughter commented though that if you turn the gate upside down, it resembles a horseshoe, which is also one of St. Martin's symbols. Either way, it is simple to make. First, make some cinnamon toast. 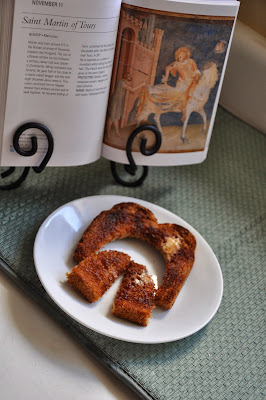 We like to toast the bread in the toaster, butter it and then sprinkle on the cinnamon sugar. Then, I used the bottom edge of my cheese grater to cut out a rounded shape to look like a cloak. 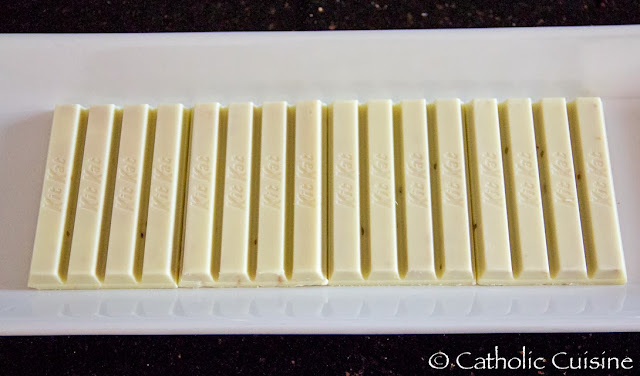 You could use just a knife though and cut out the shape by hand. Now you have a gate and a cloak. Just serve it up, let the big kids cut the cloak in half themselves or score it for the little ones to tear in half and tell them the story of this most generous saint. 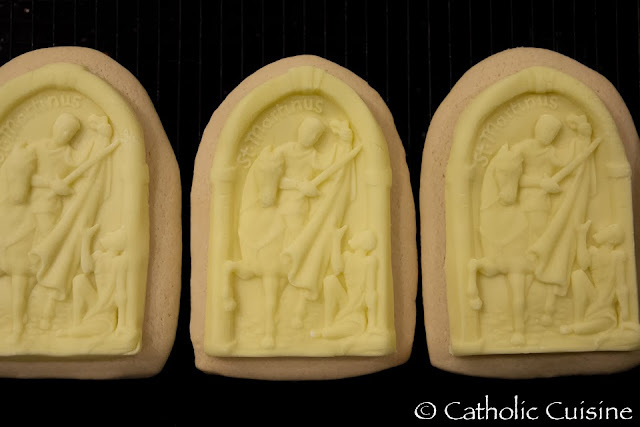 After seeing the beautiful and amazing All-Saints Themed Cookies shared by Lynne last month I decided to order a cookie mold and see if I would be able to make them as well... Looking through all the links she shared I had a hard time deciding which mold(s) to order! 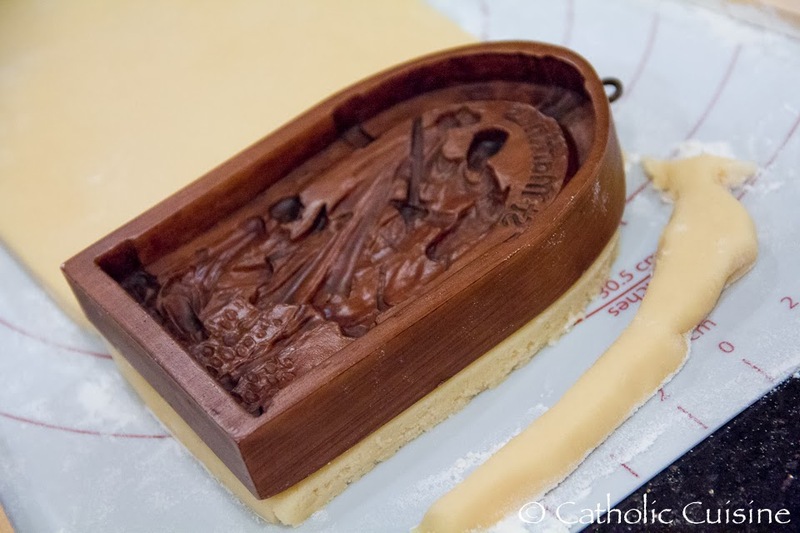 Since we have plans to celebrate Martinmas with friends this year I ended up choosing the St. Martin mold (as well as a St. Nicholas and a Christmas mold which I hope to use to create Christmas gifts for some of our friends and godchildren next month)! The St. Martin Mold: A wondeful, dimensional, German depiction of the famous episode when Martin cut his cloak in two, giving half to a shivering beggar. 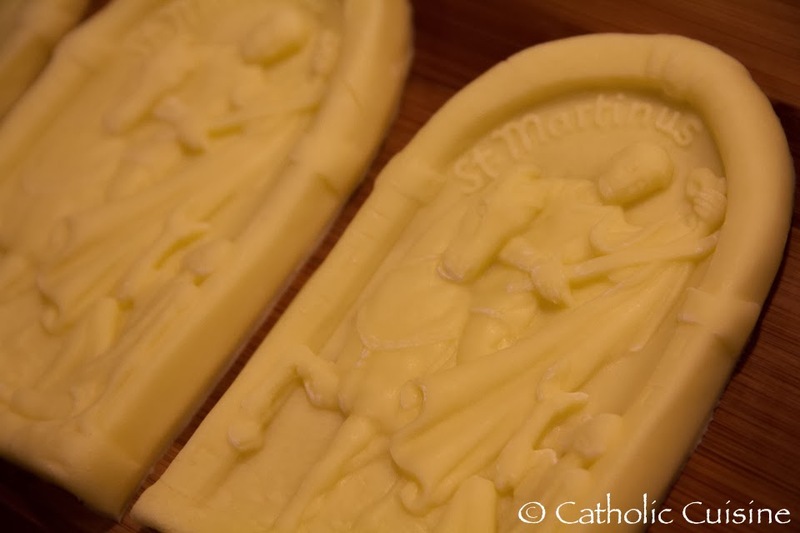 St. Martin became a patron saint of France. Actual Size: 3.5 x 5.25 inches. Chill until hard. Roll out on floured surface to 3/8" inch thick. Cut out shapes. 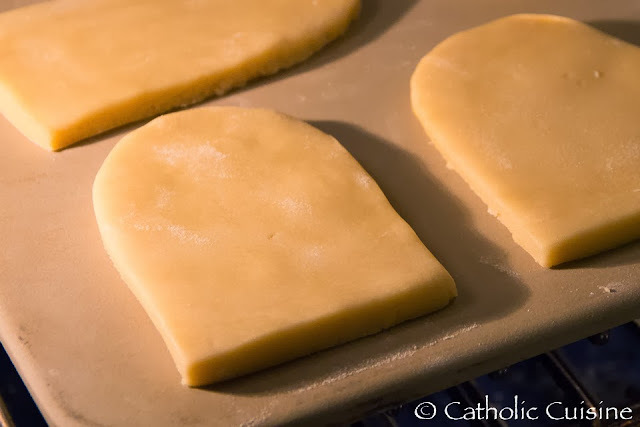 Bake at 350 degrees for 11 minutes (for 3 inch cookies) or 9 minutes (for 1 1/2 in cookies) OR until bottoms of cookies are barely browning. Note: I used the mold as a guide for cutting out the St. Martin cookies and baked them for approx. 15 minutes. After the cookies had been baked and cooled I started creating the fondant tops. Next time I plan to make our own marshmallow fondant, but this time I kept it simple using a package of pastel yellow pre-made fondant. Rolling the fondant to the recommended ¼ inch thickness I was able to decorate nine large cookies with the St. Martin design. I followed Lynne's directions and it was just as easy as it sounded: Lightly dust your mold with powdered sugar. 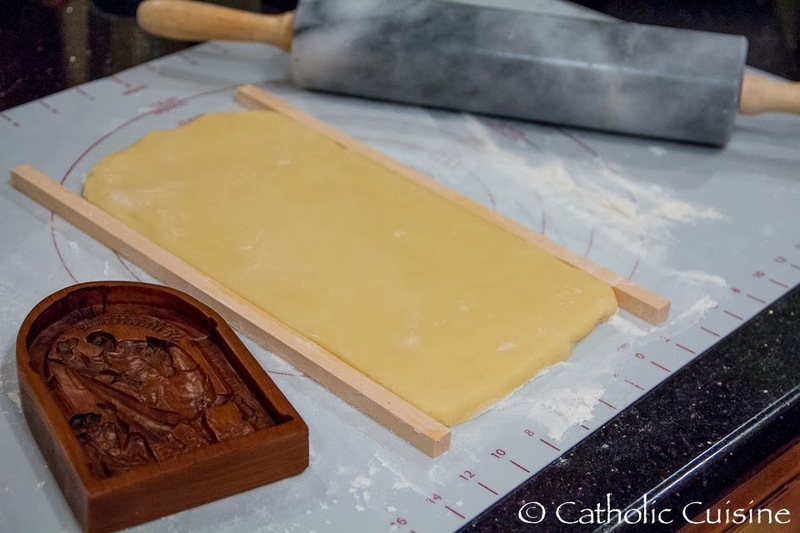 Press the rolled out fondant into the mold starting from the center of the mold and working your way to the edges. Be sure to press the fondant into all of the deep areas of the design, you can feel the indentations as you press down on the fondant. 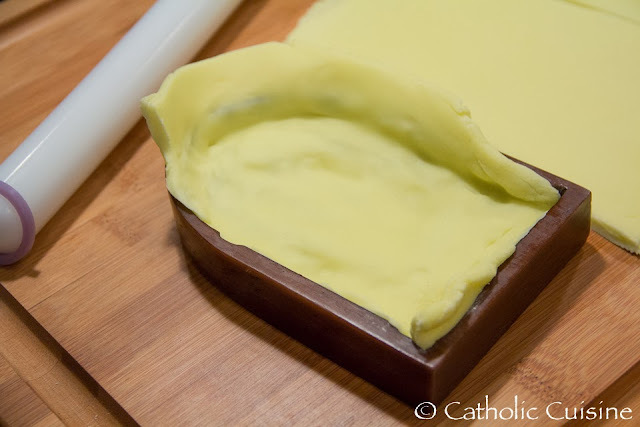 Starting from the edge carefully peal the fondant from the mold. 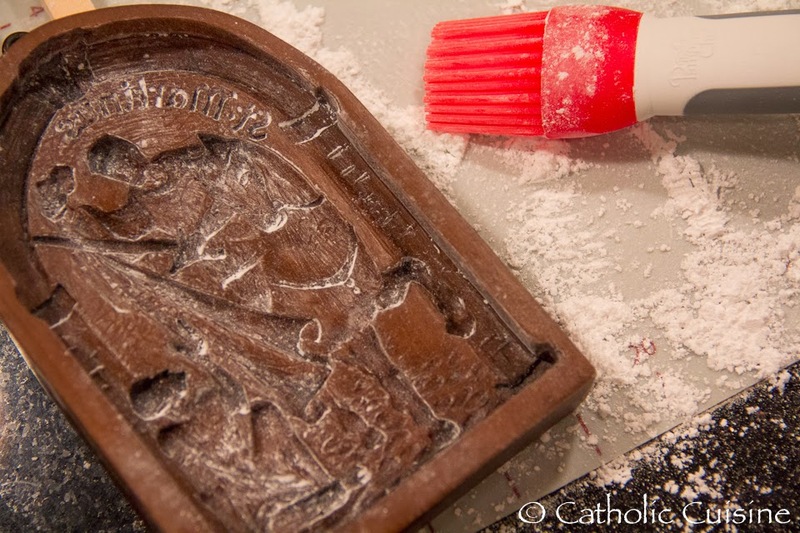 Trim the edges of the design then ‘glue’ the fondant to the cookie by brushing the top of the cookie with light corn syrup. These cookies were so much fun to make and I can't wait to share them with all the children tomorrow after we read about St. Martin and decorate lanterns! 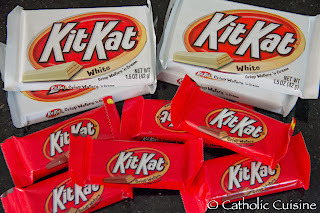 I know that most of our families have had an overload of treats this time of year! 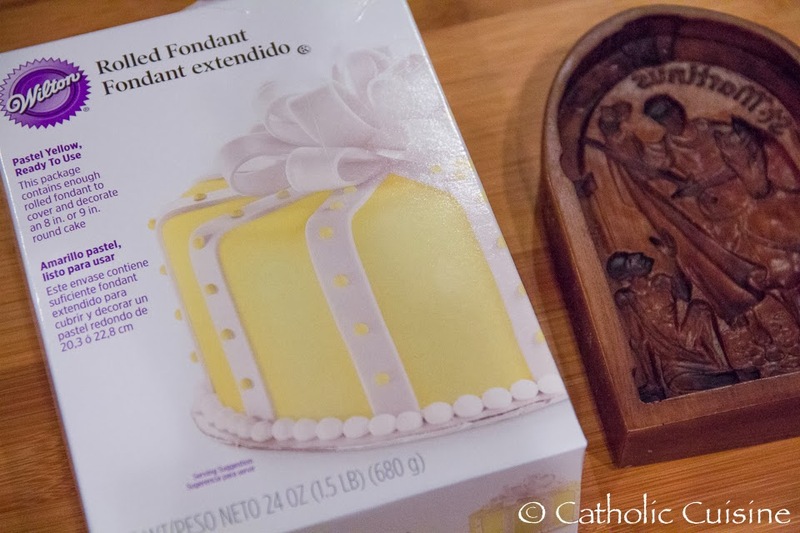 However, just in case you might be looking for a quick dessert to fill tummies after your All Souls Day prayers, here's an easy idea for you…All Souls Prayer Parfaits! Make Jell-o pudding according to box. Layer pudding, sprinkles and crushed oreos. God bless you for your generous prayers for All Souls!